While I was reading the first few chapters, to be perfectly honest, I thought I knew what to expect from this novel. I even thought that the entire story was a little bit cliche - here we have your average, ordinary girl (except this one has a life-threatening disease) attending high school for the first time, makes both great friends and awful enemies on her first day alone, and finds herself smack in the middle of a love triangle. I was rolling my eyes good-naturedly, thinking that there was nothing special about this book other than how on point the MC's voice was. Heck, I was even mentally writing the first two paragraphs of my review after the first few pages or so! So you can just imagine my shock when Broken went into completely uncharted territory and left me floundering and stuttering while reading its latter half. This book was NOT what I expected... AT ALL! (And once again, a book teaches me a lesson - sometimes, it's simply impossible to predict where a plot is going!) Gone are all the thoughts of Broken being the least bit cliche, because I'm pretty sure that I have yet to read a book even remotely similar to this one. So props to you, CJ Lyons - I can barely string a coherent interview together because your book blew my mind (in a good way)! I really liked Scarlet. Here you have a girl who's about to die (and she knows it), but she doesn't let that affect her disposition in life. She's being bullied left and right by her classmates who chose to label her a freak simply because of her disease, but she soldiers on and fights back against these people. Her sheer determination to actually live life as long as she can was just so refreshing to read through. Enough of those MCs who just hate absolutely everything and want to go sulk in a corner - here's someone who's actually fighting tooth and nail to live. Scarlet's voice is so raw, so gritty - with every word, you understand how she feels, even if she doesn't say it point blank. You get to know all her fears and all her dreams. Lyons did such an amazing job writing this character - by the end of the book, without a doubt, you know who Scarlet is. The supporting characters made for an interesting read as well. Despite having their own problems, I love how Nessa, Celina, Jordan, Tony, and Scarlet herself helped each other out wholeheartedly. There was nothing of the 'my problem is worse than yours' scenario or anything like that. None of these characters felt sorry for themselves - instead, they chose to support each other with all their might. Oh, I'd also like to note that I couldn't be more wrong about the whole love triangle thing. Lyons went into a completely unexpected direction, and I really loved this book a lot more because of her doing so. The story, the story... How do I even talk about it without spoiling anything? Initially, I pegged the novel as a contemporary read, but I was sorely mistaken. While Broken does indeed have aspects that fall under the contemporary genre, the second part of the novel dealt with Scarlet delving into the subtle holes of her medical history... and things got awry pretty fast, let me tell you. All in all, I enjoyed this book more than I thought I would. All the characters were compelling; the MC had such an engaging voice; and do not get me started on the awesomeness that is the storyline. 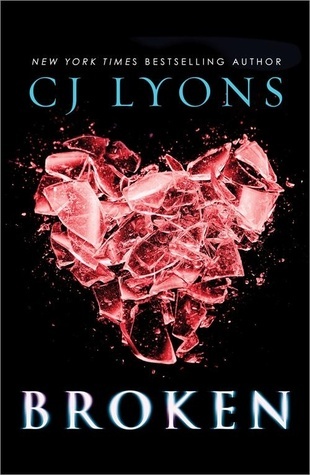 Suffice to say I'll definitely be on the lookout for CJ Lyons' books from now on! I love it when a story completely takes you by surprise, I think I would have held the same ideas and made the same judgements that you did in the first few chapters, but I'm glad that Lyons was able to provide so much more. Also aren't fierce MC's just the best? We definitely need more like Scarlet around. I will definitely be adding this book to the tbr. Wonderful review Lyra! Scarlet sounds like someone I would really, really like. I'm such a character driven reader and it sounds like Lyons delivers in that aspect. I'll be checking it out!